Progress Report – Reconstruction and study of the Vinča architecture and artifacts using virtual reality technology. Studiul de faţă reprezintă o abordare interdisciplinară necesară înţelegerii arhitecturii vinčiene. O scurtă prezentare generală a realitătii virtuale (VR) deschide drumul pentru câteva exemplificări ale modului în care s-au realizat modelele virtuale şi materialele mutimedia. Modalităţile tehnice de acces ale publicului şi ale cercetătorilor la aceste materiale sunt de asemenea discutate atât pentru acest moment, dar şi pentru viitor. An important part of our work involves the reconstruction of the excavation data representing the Vinca architecture and especially the Neolithic settlements from Parţa and Miercurea Sibiului using virtual reality technologies. Besides the reconstruction of the Vinca architecture we would like to integrate environment data and artefacts excavated from the sites. For this, we have available materials from the Neolithic stations that are already gathered. The materials from Parţa (Lazarovici et alii 2000) are published, but the materials from Miercurea Sibiului are unpublished because the excavations are very recent. Part of this reconstruction work has been done in the Marie Curie Training Site for Computer Graphics and Virtual Reality (MAVRIC) located in the Centre for VLSI and Computer Graphics, Department of Informatics, University of Sussex. Here, several heritage projects, but notably the ARCO – Augmented Representation of Cultural Objects, and recently installed equipment, provided both research knowledge and expertise as well as resources that is essential for advancing this reconstruction and research. Our virtual reconstructions (and associated animations) require large computing resources such as a ‘render farm’ and specialised 3D modelling and animation software. At the same time, the Faculty of History and Patrimony, Lucian Blaga University, is also researching the architecture of the Neolithic site from Miercurea Sibiului, Sibiu County, Romania, which will also be integrated with the reconstruction. To facilitate the virtual reconstruction work we have access to a render farm composed of two clusters of 8 and 10 machines, respectively, and a further 20 laboratory machines with which to generate large virtual reconstructions requiring thousands of video frames. Further, MAVRIC provides access to many software applications that require very expensive licensing costs essential to our research such as Windows XP professional edition, 3d studio max version 7, Macromedia Dreamweaver MX 2004, ACDSee, Adobe Photoshop, … as well as the ARCO System specific software for building virtual exhibitions utilising virtual and augmented reality, all of which is not normally available in an archaeology department. The purpose of this interdisciplinary project is to help the archaeologist to control, present and use the results of their work with the new information and communication technologies (ICT). Three-dimensional models that aid interpretation of the architecture. Visualise information of a high complexity. It can combine the visual images with the sound in a real time. Access through the Internet using virtual reality can be more easily understood by the large public without losing the quality and the original impact. This is the technology that can “bring to life” the past in a revolutionary way, this should take place at the end of each archaeological study. The costs of archaeological excavations (often from public finances) and associated work should be returned to the citizen in a cultural way through understandable forms of presentation. Most published studies address only the specialists and not ordinary people. The citizen usually only comes in contact with archaeology through museums, where the information isn’t presented in the habitual context. Lately, there is a tendency to offer to the public archaeological information in the most accessible way, for example through virtual reconstructions. It is generally accepted that virtual reconstructions, from the archaeologist viewpoint, cannot be 100% accurate. This is because there may be more than one interpretation concerning a particular archaeological fact. Therefore, it is important to ensure that the virtual reconstruction represents correctly in most cases only “the proportions and global data such that if an interpreter is unsure of any specific details, these can be bypassed, provided that the global idea is still expressed through its proportions” (Fernández 2001, 280). Virtual reconstructions or models are also used for educating students that study archaeology, but also for the continuous education of the archaeologists. At the same time, the public can understand the presented subject easily. Virtual Theatres: where immersive, simulated with stereographic glasses and Dolby surround effects, they can deeply involve users that become avatars of virtual historical scenarios. These structures can greatly enhance personalised lessons (Bonfigli et ali 2001, 295; Song and alii 2003, 203). The underlying technology improves, develops and reduces in cost every year, thus implementing these methods in museums will become very cost effective (Wojciechowski et alii, 2004, 135). Virtual Sets: historians and/or actors, immersed in specifically reconstructed virtual environments, can produce TV programmes communicating theories, hypotheses or didactic explanations in a simple and immediate way (Bonfigli et alii 2001, 295). We can add here the games industry, which has an important role in educating the adolescents. If the game industry uses models that are more close to historic reality, it is then a step forward for the educational system. Internet: reachable by everyone world wide, enables access to historical databases linked to simplified virtual environments (VRML/X3D – Virtual Reality Modelling Language – an open, extensible, industry standard and description language for 3-D scenes on the Internet. With VRML/X3D and certain software tools, you can create and view interactive 3-D worlds that are rich with text, images, animation, sound, music and video –, or QuickTime VR), streaming of TV programmes, etc. (Bonfigli et alii 2001, 295). The connection of 3D models with database content makes easily accessible historical information that can also be accessed through intuitive interfaces and appropriate interaction facilitating validation of the reconstruction. In this way VR cultural products have, as a constitutive part, the background research material and every user can check the authenticity of the models and use the information for further personal researches (Gutierrez et ali 2004, 63). Most countries have invested in 3D archaeology technologies because of the great impact on the public. It is much more sophisticated when presenting a nations heritage. Virtual reality can be used for all historical periods, but it’s easier for those periods where we have written or visual information that were kept well (e.g. roman period, Greek, medieval). 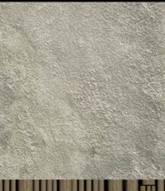 It is more difficult for the prehistoric periods because the settlements from this time used materials that easily degrade. They left only a few marks that can be seen by the public. Vin č a culture marks the end of the early Neolithic. It belongs to “The Eneolithic Balkan-Anatolian” (Lazarovici et ali 2000, 276; Maxim 1999, 63). Vinča Culture is extended on a large area that includes Macedonia, Metonia, Croatia, Bosnia, West Bulgaria, Oltenia, Banat, Vojvodina, South Hungaria and Transylvania, but it influences other cultural areas that are out of the origin space (Lazarovici 1977, 19) also. The name of the culture comes from the eponym settlement at 14 km from Belgrade, on the right side of the Danube and it is extended over 10 hectares. The geographical localisation encourages the mediation between cultures that flourished from the Aegean in the South to Central Europe in the far North. Important events, material and spiritual changes are seen in the levels with almost 10 meters of human works remaining, accumulated over the long period of time when people lived in this area. Vinča settlement distinguishes itself as a reference point in the analyses of Neolithic and Eneolithic culture’s birth and development, from Central and South East Europe (Tasić 1990). 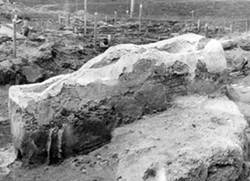 The first diggings at Vinča were made by Miloje M. Vasič in 1908. 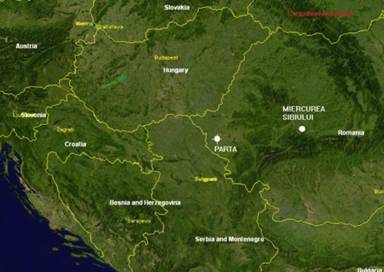 Vinča settlement represented the central point of Neolithic and Eneolithic chronological systems’ implementations. The systems are based on Vinča’s stratigraphy for building some almost stable chronological steps with the help of many cultures and groups, often with different typological characteristics that differ from the eponym settlement. Concerning the chronological systems for Transylvania, we apply the Holste’s system, modified by Vladimir Milojčić (Lazarovici 1979, 75-77, table 7; Draşovean 1996, 25) and completed by Gheorghe Lazarovici (Lazarovici 1977, 21-25; Lazarovici 1975, 12-18; Lazarovici 1979, tabel 7). There are known four evolutionary phases (A, B, C, and D) each one with its specific subdivision. Map 1. Geographical localization of Vincian’s settlement from Parţa and Miercurea Sibiului. Parţa is one of the important Neolithic settlements from North Banat. This can be seen from the systematic excavations, stratigraphic observations, lots of materials, but mostly from its monumental civil architecture (houses with floors, big houses), military architecture (fortification systems) or religious architecture (sanctuaries and shrines) – such evidence reveals a large Neolithic metropolis developed in Banat ( Lazarovici et alii 2000, 13) . The settlement is a tell with a complicated vertical stratigraphy and an architecture based on massive constructions with wooden structures, covered in clay. A lot of excavations, over the years and interdisciplinary studies made this settlement as the most excavated and researched area from the West of Romania until now. Miercurea Sibiului is a particular Vinčian settlement in Transylvania, characterised by massive structures made of wooden beams with less clay. Systematic excavations on the surface revealed a distinguished architecture that makes it the most important settlement in Transylvania. The earlier phases of Vinča Culture were pointed out in Transylvania relatively recently by our team (Luca et alii 2000). 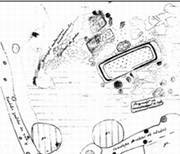 In 2003 campaign there were discovered the earliest vinčian complexes (pit houses B 4-6, 8 and holes G 7, 11-12, 13b, 14). The pit houses and the early vinčian holes belong to an aspect of chronology situated towards the end of the A phase. In the 2004 campaign, 4 dwellings were totally or partially researched. They were surface dwellings, with the floor made of river stone dated from Vinča A 3-B 1. A few engrossed complexes were shaped (V A 3; St-C IB-IIA, IIIB) (Luca et alii 2005; http://www.cimec.ro/Arheologie/cronicaCA2005/rapoarte/151.htm ) . Examples of reconstructions and interpretation, advantages and target public. For creating the virtual models of the architecture and the environment we used the 3d studio max, 7.0 version, developed by Discreet for which the Centre for VLSI and Computer Graphic, University of Sussex has licence. If the models are very easy to make, the most difficult part is to realise the material’s texture that must look real. All the objects are made in 3D Studio Max using the plans and the offered technical specification. Objects are made using different techniques. The textures are applied on these objects (using large images in .jpeg or Bitmap format). The next step is doing the animation. After the scene was animated and after the lighting and effects were added, the rendering comes. For this purpose we used a “render farm” made up of 12 computers which transformed the scene into a movie. We used .avi video format (Audio Video Interleave – format was developed by Microsoft. The AVI format is supported by all computers running Windows, and by all the most popular web browsers. It is a very common format on the Internet). The movies have a very good resolution, but they are very large (sometimes 700 MB for a 2 minutes movie). We used Adobe Premier for adjusting the movies in .avi format. For web streaming, we used tools provided by Microsoft, Windows Media Encoder 9 Series with which we transformed the movie from .avi format into the .wmv (Windows Media File format was developed by Microsoft) format with the web streaming characteristic. We used a middle setting which permits a fast loading in browser of the movie: Multiple Bit rate video (CBR) with a Total Bit Rate = 250 kbpr, Frame Rate = 27.7 and Output Size = 320x260. The size of the movie can be reduced to 1-2 MB. We used the HTML code to load Windows Media Player automatically in browser. We tested how the movie loads in Internet Explorer 6.0, Mozzila 5.0 and Opera 8.5. With these characteristics the movies are uploaded on all browsers quite rapidly. We made educational movies with the reconstruction’s process of different architecture elements from Parţa and Miercurea Sibiului, and for the validation of different archaeological interpretations. We had a dialog with the specialists that excavated at Parţa and Miercurea Sibiului so that now we have a whole view over Vinčian life from the two sites. Virtual reality offers an integrated archaeological view. The materials are also presented in a more accessible way for the public. We have integrated the virtual structures in VRML/X3D format for the web environment because building a “virtual museum “on line is very important. For the architecture, we used the observations gathered from the Miercurea Sibiului and Parţa sites, from the analogies in the Vinčian cultural space, from project – Cucuteni project ( http://arts.iasi.roedu.net/cucuteni/arheo/casa/ ) and ethno archaeological research of the Romanian-English team coordinated by John Nandriş ( Lazarovici et alii 2000, 10). 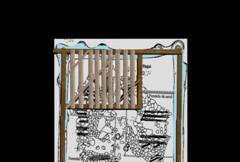 The research results of the wooden installation permitted the development of ethno archaeological reconstruction. On the site, the clay floor is cleaned (Figure 1. a – real pictures), then it is turned over (Figure 1. b – real pictures) and the hidden wooden sub-structure of the floor is revealed and recorded on site through drawings. The drawings and photographs are imported to 3ds max 7 to use as a reference point for the virtual reconstruction (Figure 1. c the drawing of the mirror image of the wooden floor construction as imported into virtual space). In the virtual space (the 3ds max 7 3D authoring environment) the wooden structure is reconstructed as a virtual model (Figure 1. d). 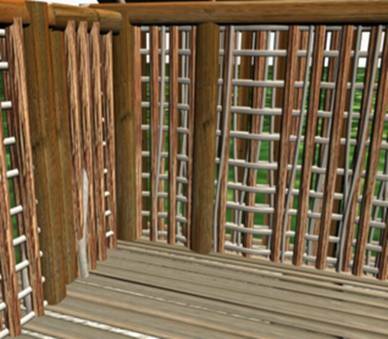 We have now created a virtual reconstruction of the mirror image of the wooden floor structure. Next we turn the wooden floor back to original orientation (Figure 1. e). The wooden beam structure now provides the support of the floor over which, there is added a mixture of clay, straw and water (Figure 1. f). At Parţa houses’ excavations reveals foundations constructed from a series of holes in which pillars are inserted to support the basic structure of the houses. This was the most frequent system used to build houses (Figure 2. a). At some structures, there were observed massive pillars, but at others there were observed even small poles (Figure 2. a-b). 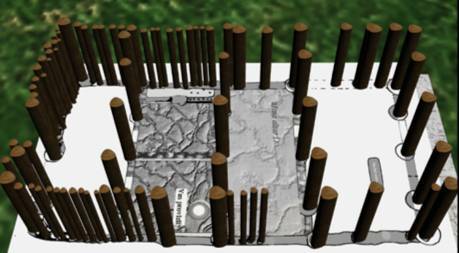 In the virtual space, the wooden structure is filled on the plan (Figure 2. b-c – sanctuary 2). Next we start to create the walls by knitting together a very dense network of poles and rods. 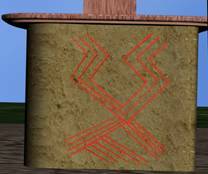 We know this is how the wooden supporting structures of the walls were constructed from the excavated ‘fired’ clay leaving an imprint of the wooden structure. When the structure burns, the clay changes its firmness, it becomes very hard and it keeps maintaining the marks of the rods and the pillars (Figure 1; Figure 2. d right image). Figure 2. d) Wooden structure (left –virtual space, right- marks in wall remains). Figure 2. f) The roof’s straw structure. Figure 2. g) The floor and the walls, first sanctuary (left – outside, right – inside). There are added beams on the structure (Figure 2. d-e). The structure must be rigid, so osier, lime tree crust or bark, twisted rye, and animal bowel were used to tie the beams, rods and poles together. The wooden structure of the roof is then made (Figure 2. e). 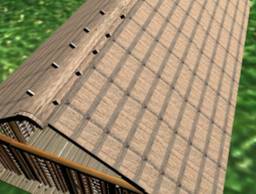 The roof is covered with dry hay sheaf, straw, bulrush or cane (Figure 2. f). Afterwards, a mixture of clay, straws and water is added (Figure 2. g) to finish the walls. In an archaeological experiment for an Eneolithic house (a house of 7x4 m), there were used for the wooden structure of the house 2 oak trees, 33 lime trees and 245 hazel nut rods. The four walls needed 15 tonnes of clay and 3080 litres of water. The majority of the excavated complexes in Parţa are around 11x6 m so the quantity of wooden and clay material used is huge. This monumental statue reproduces a divine couple: Big God Mother and her acolyte, Bull God. From the Bull God, there were found fragments from an ear, a part of the horn, fragments from the forehead and also the muzzle/snout. Elements that attest to the practise of the bull cult are all over the sanctuary and in some complexes with the presence of the bull’s forehead with horns. Figure 3. a) The double statue’s plan, second sanctuary, Parţa. Figure 3. b) The double statue- in situ. Parţa (after Lazarovici et alii 2000, pl. 80, 3). Figure 3. c) The double statue- interpretation attempt (drawing). Figure 3. d) The virtual reconstruction of the superior part of the double statue. Front view. Figure 3. e) The virtual reconstruction of the double statue’s base with the red motive’s incision. The archaeologists succeeded in explaining in detail the way in which the statue was built, but they also noticed other interpretations. Of the monumental statue partially remaining; many elements were extended over a large surface (Figure 3. a-b). The excavator illustrates an interpretation (Figure 3. c). In the virtual space, we tried to give a truthful image of the statue (Figure 3. d-e). Using 3ds max 7 we can import a archaeologist drawing of a pot with its profile and use the NURBS tool to draw round the profile (Figure 4. 1). Next the NURBS curve can be extended by using the Lathe function to rotate the profile thus generating a wireframe pot whose surface can be then textured by adding a UVW mapping for material adjustment. (Figure 4. 2). Figure 4. 1) - fragmentary pot with entire profile from bottom to top. Prepared for modelling. Virtual space. Figure 4. 2) The pot with the texture (the original colour in a .jpeg picture). Virtual space. Figure 4. 3) The end results in perspective view of the pot in virtual reality space. 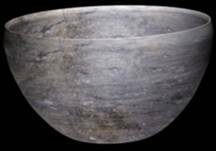 The pot is now realised as a virtual reconstruction or 3D replica (fine technology, grey colour, polished), (Figure 4. 3). Example 5 The reconstruction of house P 8 from Parţa and the dissemination of information for the public (available on our web site at: http://arheologie.ulbsibiu.ro/santiere/parta/en/p8.htm). Each architectural model has a description in which way it was reconstructed (Figure 5). There can be also be seen animations which show how the building was most likely constructed, but you can immerse yourself in the virtual space and you can explore the model directly in the browser. From 3D studio max you can export the model in VRML format. To view the model in VRML you must use a VRML viewer. We recommend Cortona VRML Client which is free, it goes fast and it doesn’t create problems and it’s available for a lot ( http://www.parallelgraphics.com/products/cortona/) of browsers and operating systems. Technical details are an important element of virtual reconstructions and they are presented in an attractive way. For these technical details, the original source where they had been published is presented each time. Figure 5. 1) The original drawing plan (after Lazarovici and alii 2000, figure 87). Top view. Figure 5. 2) The plan of the P 8 structure and the elevation of poles (virtual space). Top view. Figure 5. 3) The pillar ’s structure / the structure of pillars (virtual space). Perspective view. Figure 5.4) Detail with the way of the storey reconstruction (virtual space). Top view. Figure 5. 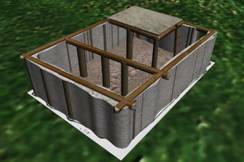 5) The elevation of clay walls and of the storey (virtual space). Perspective view. In the future, all the interdisciplinary work associated with our archaeology should be published on our web site where possible as an online resource for access by our students to aid their understanding. In addition, the public can also access this resource for their learning. This article serves as an example instrument for understanding the work we have done until now illustrating the use of virtual reconstructions and collation of these virtual reconstructions with other archaeological data on the Internet as a so called virtual museum or exhibition online. This is an ideal medium for guiding our students and the wider public in understanding the Neolithic way of life. This does not necessarily remove the need to publish our work in the classic format, but the online method using virtual reconstructions is an important supplement to the classical archaeological reports and provides an interesting and enjoyable way of presenting complex information to the student and public alike. 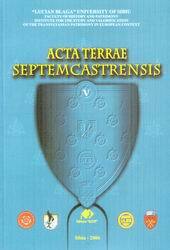 Within our archaeological institution we publish all our informations (books, reports, monographs, presentation, study guides, etc. including our virtual reconstructions) in order to make this information available in digital format for all and to create a better educational impact and good quality of presentation. Thus our digital publications including virtual reconstructions can also be accessed instantly from all over the world.. Digitisation of all our resources is costly, but the maintenance costs are lower over long term and the number of those who have access to the Internet grows very fast. For example our site http://arheologie.ulbsibiu.ro/ is a subdomain of http://www.ulbsibiu.ro/ hosted by Lucian Blaga University. 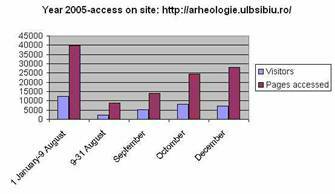 Since it has been created (in October 2004), it was accessed by 42243 visitors that accessed 140200 pages (from a few hundreds visitors a month in 2004 to over 7 thousands in December 2005). Besides the classical information: courses, books, etc. we have an initial online resource in the style of a virtual museum opened to the public, see link below. Such information can also be used by the public when they visit the real museum using web accessible devices. 7. kiosks and touch screens points. All of them cannot give the independence for visitors and only no. 5 can offer everything (sound, image and a virtual reality feeling). Until now, only the audio device gave some independence. In the next 2-3 years the new Mobile phones with Bluetooth wireless technology, large resolution screens, capable to run movies, will be a reality. At the same time, PDA devices are improving in performance. Visitors will use them like an Avatar for explanations (audio, texts, animations, images, movies). Visitors will be able to search through the mobile devices (for audio, texts, animations, images, movies) in the actual museums archive in the same time PDA devices can be offered by museums. Visitors, in the front of a monument or object with their mobile or PDA device will see the virtual reconstruction of the original habitat, more information about the object like descriptions, object design, pictures or audio materials. The visitors will be able to save samples of the information viewed such as movie clips, explanations etc, for reviewing them later on the bus, or at home and the educational message will be reinforced deeper than usual. 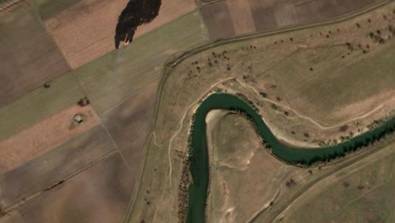 Satellite picture: Tell 1 from Parţa. Maria Elena Bonfigli, Antonella Guidazzoli, Silvano Imboden, Massimo Alessio Mauri, Maria Chiara Liguori, 3D Modelling, Virtual Reality and the Creation of Flexible Didactical Tools , Proceedings of the 2001 conference on Virtual reality, archeology, and cultural heritage, 2001, p. 295-295. Florin Draşovean, Cultura Vinča Târzie(faza C) în Banat, Timişoara, 1996. José Antonio Fernández Ruiz, Scientific and ethical scope of digital modelling in architectonic heritage. Virtual Reality, Archeology, and Cultural Heritage 2001. Athanasios Gaitatzes, Dimitrios Christopoulos, Maria Roussou, Virtual reality, archeology, and cultural heritage , Proceedings of the 2001 conference on Virtual reality, archeology, and cultural heritage, 2001, p. 103-110. Diego Gutierrez, Francisco J. Seron, Juan A. Magallon, Emilio J. Sobreviela, Pedro Latorre, Archaeological and cultural heritage: bringing life to an unearthed Muslim suburb in an immersive environment, Journal of Cultural Heritage, 5, 2004, p. 63–74. Gheorghe Lazarovici, Periodizarea culturii Vinča în România, In: Banatica, 4, 1977, p. 19-44 . Gheorghe Lazarovic, Neoliticul Banatului (I-II). In: BMN, 4, 1979. Gheorghe Lazarovici, Florin Drasovean, Zoia Maxim, Parţa – monografie arheologică (Ia-b) . In: BHAB, 13, 2000. Sabin Adrian Luca, Horia Ciugudean, Aurel Dragotă, Cristian Roman, Faza timpurie a culturii Vinča în Transilvania , In: Angvstia, 5, 2000, p. 37-72. Sabin Adrian Luca, Cosmin Suciu, Adrian Georgescu, Dragoş Diaconescu, Miercurea Sibiului -Petriş , in: CCA , 2003. Sabin Adrian Luca, Cosmin Suciu, Adrian Georgescu, Dragoş Diaconescu, Miercurea Sibiului -Petriş , in CCA, 2004. Zoia Maxim, Neo-Eneoliticul Transivaniei , Cluj-Napoca, 1999. Meehae Song, Thomas Elias, Dr. Wolfgang Müller-Wittig, Dr. Tony K.Y. Chan, Interacting with the Virtually Recreated Peranakans, Proceedings of the 1st international conference on Computer graphics and interactive techniques in Australasia and South East Asia , Melbourne, Australia, 2003, p. 223 – ff. Cosmin Suciu, Virtual Exposition – educational project . In: Studii de Istorie Veche şi Arheologie, BHAC, 4 , p. 17-24. Nikola Tasic, Dragoslav Srejovic, Bratislav Stojanovic, Vinca – Centre of the Neolithic culture of the Danubian region, Belgrade 1990. Rafa Wojciechowski, Krzysztof Walczak, Martin White, Wojciech Cellary, Building Virtual and Augmented Reality Museum Exhibitions, Proceedings of the ninth international conference on 3D Web technology Monterey, California, 2004, p. 135-144. Allen, Robert (ed. ), The New Penguin English Dictionary, In: Penguin Books, 2000. Marie Curie fellow in the Marie Curie Training Site for Computer Graphics and Virtual Reality (MAVRIC), Department of Informatics, Centre for VLSI and Computer Graphics, University of Sussex. Director of the Centre for VLSI and Computer Graphics, Reader in Computer Science.